A longtime Veterans Affairs volunteer lost confidence in VA health care after treatment for a shattered leg bone ended with an amputation below his knee. 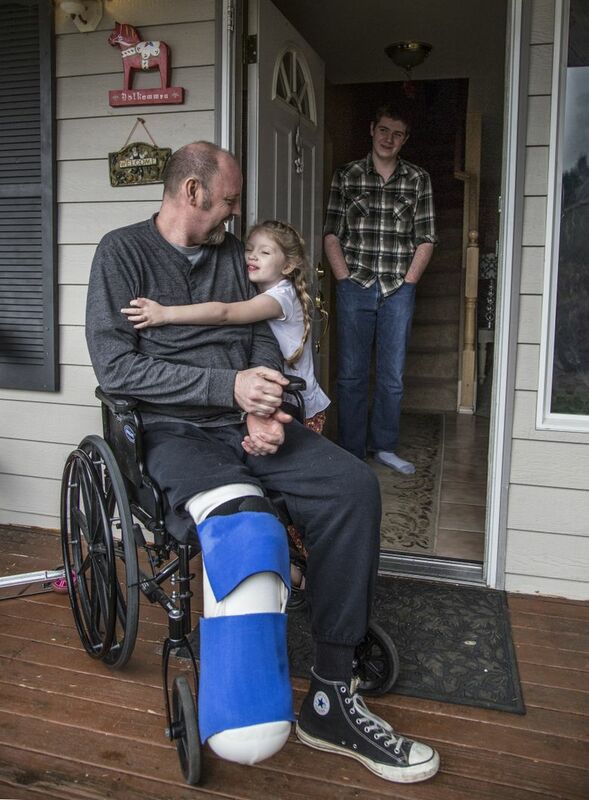 When Tim Kuncl shattered his shinbone after falling from his Puyallup home’s rooftop while hanging Christmas lights in 2011, he trusted that his local Veterans Affairs hospital would return him to health. But more than three years and three surgeries later, the 45-year-old Coast Guard veteran’s confidence in VA health care has also been smashed. “It ruined my life,” said Kuncl, a married father of four. From the get go, Kuncl’s complicated bone break challenged doctors. Each surgery at the VA Puget Sound Health Care System in Seattle succeeded only in leaving him in escalating pain, Kuncl said. His agony became so intense he could barely control his bladder when he walked. 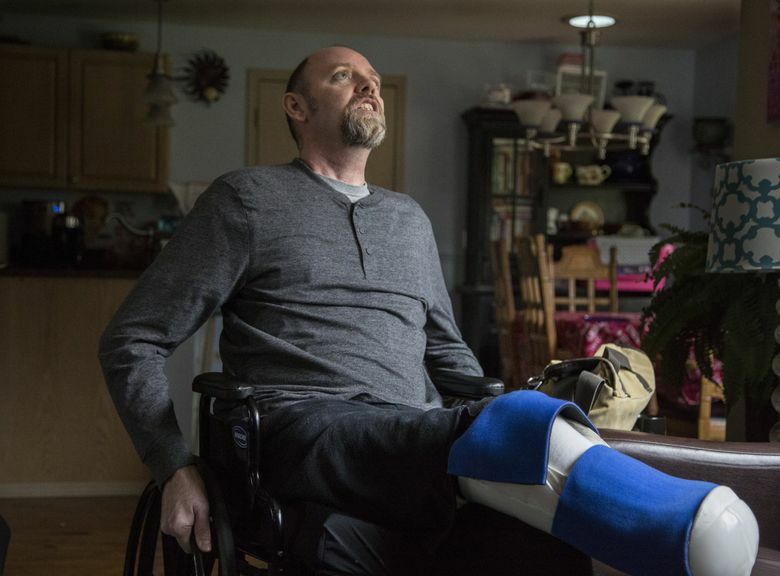 Last fall, after a VA nurse told him his pain was partly neuropathic — even though X-rays showed problems with surgical hardware — Kuncl finally had had enough. He turned to treatment at a private hospital, where he learned his leg damage left him few options. Now, with only a stump below one of his knees, Kuncl is recovering from recent amputation surgery while sounding an alarm for other vets. “I don’t want to see what happened to me happen to anyone else,” said Kuncl, a longtime VA volunteer. Often the object of criticism, VA health care remains under fire in the wake of a national controversy that rocked the federal agency last year. The waiting-list scandal, which emerged at the VA’s Phoenix hospital, revealed veterans were dying while waiting for medical appointments. Meanwhile, hospital staffers covered up the delays by falsifying records. In the scandal’s fallout, VA Secretary Eric Shinseki resigned and scrutiny of VA health care intensified nationwide. A year later, many veterans agree with local VA officials’ assessment that waiting times for appointments at Puget Sound facilities have dropped. Still, some vets and their advocates contend quicker visits are masking deeper problems of understaffing, inexperienced doctors and poor care quality. Last year, Congress passed a law to provide $15 billion in new funding for veterans’ health-care access. It requires the VA to offer care to veterans from a non-VA provider when VA facilities cannot provide an appointment within 30 days. Despite the new law, the federal Government Accountability Office (GAO) last month put the Veterans Health Administration (VHA), which oversees 152 VA hospitals and 817 outpatient clinics nationwide, on its list of “high risk” agencies due to “persistent weaknesses” in oversight, training and other areas. The GAO noted that more than 100 previously identified problems with the VHA remain unresolved. Meantime, malpractice claims against the VA have spiked nationally since the April 2014 wait-list scandal, data show. Wrongful-death claims during the second and third quarters of 2014 climbed 43 percent over the same span during 2013. In a letter last month to The Seattle Times, J. Thomas Burch Jr., a lawyer in the agency’s Office of General Counsel, noted the VA paid just 453 malpractice claims total while providing more than 107.8 million patient visits nationwide in 2013. The small fraction of payouts per visits underscores the VA’s commitment to high quality and safe care, Burch noted. “Given the inherent risks associated with health-care delivery, however, VHA — like all health-care providers — does occasionally experience unexpected adverse outcomes in a small percentage of cases,” Burch said. During an interview last month, Dr. Scotte Hartronft, the VA Puget Sound Health Care System’s deputy chief of staff, added the regional system is improving and provides care at a quality higher in many areas than most VA hospitals. Local VA officials declined to comment about Kuncl’s case, even though regional spokesman Chad Hutson for weeks indicated they planned to and had Kuncl authorize the VA to speak publicly about his care. A few hours before a scheduled interview last month, Hutson said the VA wasn’t going to talk about the case because Kuncl hadn’t formally complained. Instead, Hutson and Hartronft spoke generally about quality-of-care issues. Hartronft noted individual anecdotes from veterans about bad experiences are countered by data showing the regional VA’s care in certain areas rivals or outperforms many private hospitals. “Perception sometimes lags reality,” Hartronft said. Due to his fall, Kuncl suffered what’s known as a pilon fracture — a relatively rare bone break that can occur after falls from height and be challenging to treat. Kuncl, who served seven years’ active duty in the Coast Guard during the 1990s, scheduled surgery at the VA’s Seattle hospital on Dec. 27, 2011 — about three weeks after his fall. Surgeons inserted pins, screws and plates to realign his broken tibia. Over the next year, Kuncl visited the hospital more than three dozen times and saw a variety of caregivers, records show, but his healing progressed slowly. When he finally could walk with a cane, hobbling even a few feet each day left him in agony, he said. To cope, he relied on VA-prescribed medications, including Ibuprofen, Dilaudid and Oxycodone. The meds left him sleepless, depressed and addicted, but failed to take away his pain. He drank more and his home life started to unravel. A year before his injury, Kuncl lost his $90,000-per-year job at a company that trained port workers after he disputed expense reimbursements. With his injury, the role of breadwinner fell to his wife, who worked part time at a children’s clothing store. Meantime, Kuncl’s pain kept him from activities he once enjoyed with his kids. “My family was really suffering,” he said. When Kuncl’s doctors found bone fragments had broken loose from his still-unhealed bone, they recommended another surgery. While scheduling it, Kuncl said VA staffers asked what medications he was taking. In December 2012, VA doctors operated a second time to remove the loose fragments. They also found that two screws meant to stabilize Kuncl’s broken bone “were quite loose,” surgery notes show. Surgeons removed the old hardware, grafted more bone onto the fracture and inserted new screws and plates to fasten it together. Kuncl underwent several months of physical therapy and eventually started walking again. Doctors diagnosed Kuncl with ankle arthritis and recommended yet another surgery. Fusing his ankle and shinbone would limit his ankle mobility but eliminate much of his pain, they said. In March 2014, VA doctors performing the fusion surgery found that screws inserted during a previous operation “were all broken,” notes in his medical file show. They inserted new screws to compress the bones together, but Kuncl said he soon knew the fusion had failed. “My pain was 10 times worse than it was before,” he said. As the months passed, Kuncl had dozens of VA appointments, but the pain persisted. Meanwhile, he finally landed a new job as a port security officer just as the VA discontinued his pain medications. Within two weeks, Kuncl’s pain forced him to resign. During his final visit to the VA last September, X-rays showed screws were protruding from bone into flesh. 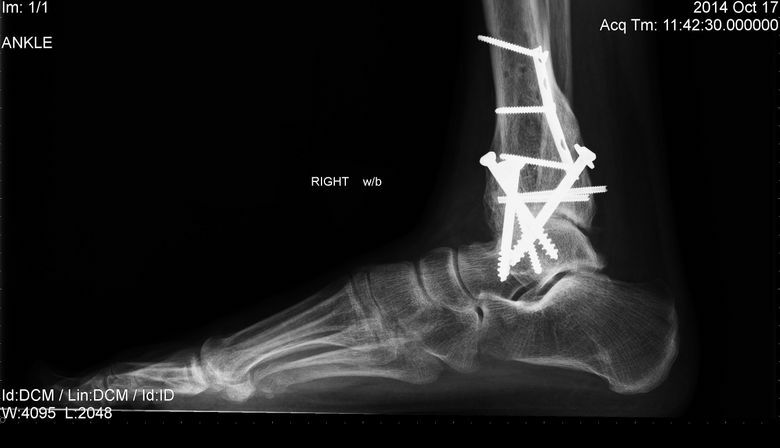 A fragmented screw piece or drill bit could be seen abandoned in his ankle. Gaps were visible between the ankle and shinbone, indicating they didn’t fuse. Still, a doctor who reviewed his X-rays said his “joint is mostly fused,” notes show. The VA recommended Kuncl schedule another appointment. He contacted a private health-care provider instead. Although declining to talk about Kuncl’s case, Dr. Hartronft pointed to data showing this region’s veterans hospitals perform better in several areas of care — including heart failure- and pneumonia-mortality and readmission rates — than most VA medical centers and several private ones. Quarterly reports gauging quality-of-care measures also show that VA Puget Sound has improved in several areas over the past year. The regional VA system also has reduced average wait times for new patient appointments from 59 days in June to 37 days as of last week. The VA’s goal is 14 days. In the meantime, Puget Sound’s VA last year increased staff by 31 and served 97,526 patients — about 4,000 more than in 2013, said Hutson, the regional spokesman. With its budget allocation set to climb from $7.4 million in 2015 to $14.9 million in 2016, the regional system expects to hire about 125 new employees over the next two years. 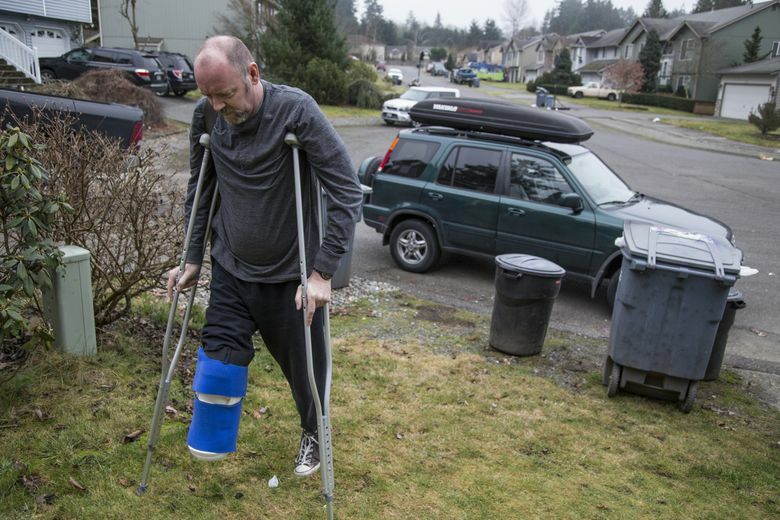 When doctors for the Multi­Care Health System in Pierce County reviewed Kuncl’s X-rays last fall, they found the abandoned drill bit embedded against his injured bone. Another screw had been drilled through a nerve bundle, and bone surfaces were left jagged, making it hard for fusion to occur, interviews and records show. Pakzad gave Kuncl two options: Let him try to repair the failed surgery, or amputate. Even if successful, Pakzad said, the first option likely would mean a lifetime of pain. “The decision was simple,” Kuncl said. On Dec. 2, 2014, Pakzad amputated Kuncl’s right leg below the knee. Kuncl now deals mostly with “phantom pain” in a limb that no longer exists. It’s nothing compared to the pain he once endured, he said. Still, Kuncl said he had options other vets don’t have. During his ordeal, he qualified for Social Security disability, which allowed him to get Medicare that covered private care. Information in this article, originally published March 9, 2015, was corrected March 18, 2015. A previous version of this story incorrectly stated the number of additional employees the Puget Sound Veterans Affairs hospital had added in the past year.